The Mission Center was blessed to welcome staff from Project Mexico for missionary training. 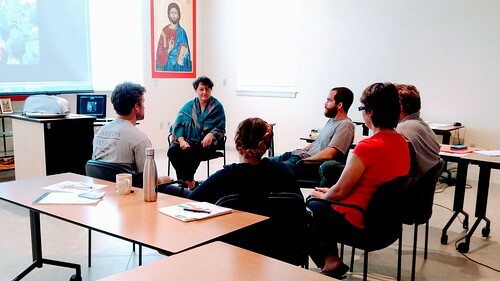 During their time they participated in discussions and workshops aimed at helping them to grow and support their ministry work. This week we are pleased to welcome 5 individuals from Project Mexico to the Mission Center! They’re here for the week to participate in the New Candidate Orientation (NCO) program, which readies them for long-term missionary service. Typically this program is used for people that will be serving abroad long-term through OCMC, and this is the first time that the missionaries we train will be going on to work for Project Mexico afterwards. Just a few weeks ago, we came together with Project Mexico for the Swim for Hope fundraiser. A month before that, we worked together with them on a home-building project in Mexico. This coordinated training effort is yet another event in the vein of our two organizations continuing to collaborate, and so it is very exciting for us! The week’s schedule includes sessions on everything from evangelism and church planting, to honoring cultures and budgeting. Sessions are led by our staff here at the Mission Center including Geoff Whiteman who came in from Kentucky and by guest speakers via webcam such as Nathan Hoppe (missionary in Albania) and Fr. David Rucker (missionary in Alaska). The participants reported especially enjoying the sessions on ministry. Before and after these sessions, each day is bookended with prayer - the most important component of missionary preparation and service. This experience also provides a chance for the participants to get to know the staff of OCMC. Much of what we do on a daily basis entails building the infrastructure and support systems that sustain our missionaries. It is always a blessing for staff to be able to meet the people face-to-face who are being called to serve. Spending time with those dedicated to carrying out Christ’s great commission always strengthens and inspires us here at the Mission Center. And remember - you can be a part of these ministries too! By visiting us at ocmc.org, you can see the many opportunities for either serving as a short or long-term missionary yourself, or for supporting these efforts in other ways.